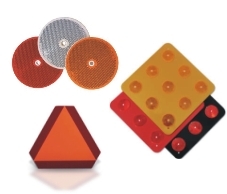 Delineators & Reflectors from Street Sign USA! Street Sign USA offers a wide selection of reflective buttons, delineators and object markers with prices starting as low as $3.99 each. Designed for a variety of uses, delineators compliment our entire line of sign related products. Municipal grade & MUTCD compliant markers & delineators. Laminated with 3M Engineer Grade Prismatic (EGP) reflective sheeting or upgrade to 3M High Intensity Prismatic (HIA) sheeting where noted.